Larry and I at Adam’s bris. Adam was asleep in his bassinet, waiting to go home. This year, as we prepare for Passover, my thoughts are not only on the upcoming holiday but also the memories of a very special Passover thirty-six years ago. At this time in 1978, Larry and I were anxiously awaiting for the birth of our first child. My mother and my older sister had delivered their babies early and easily, and I was expecting the same experience for me. It didn’t turn out that way. After I had gone through several hours of unproductive labor, our baby was delivered on his due date, Saturday, April 15, by Caesarian section. Despite the unexpected surgery, Larry and I were absolutely thrilled. We had a perfect healthy little boy, our little tax deduction, our Adam Michael Shapiro. Now that we had a son, we needed to plan a bris. Unlike today’s births, the average stay for a woman who delivered by c-section in the 1970’s was eight days. We arranged to have the ceremony and celebration in one of the conference rooms in St. Peters on the following Sunday. Now we faced the difficulty of finding a rabbi and/or moyel. Sunday was the second full day of Passover. As a C-section was not a “natural birth,” the holiday technically superseded the commandment of the bris on the eighth day. Fortunately, my brother and sister-in-law had a close friend who was the daughter of a local rabbi, and he graciously agreed to officiate on “yontiff.” One of the doctors in my ob/gyn practice, who was Jewish, agreed to perform the circumcision. That did it for me. I was recovering from major surgery, we were planning on a bris on Sunday, and now I was facing more possible hospital time. I did what any other sane, sensible postpartum mother would do: I had a complete, hysterical melt-down. Unfortunately and to add to the drama, Larry was at a seder at a friend who had an unlisted number, so it took some effort to get the phone operator to agree to contact Larry and then have him call me back. 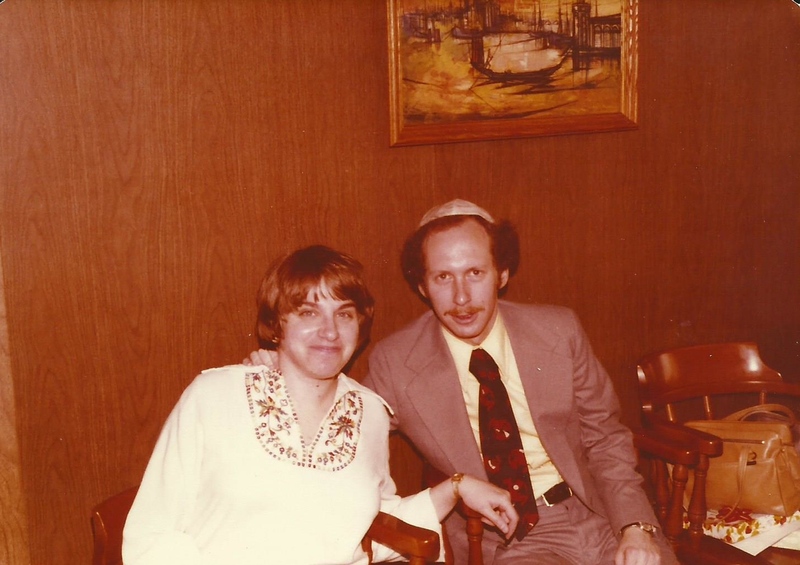 Once he was reached,, Larry left his friend’s house mid-seder and drove back to the hospital to comfort me. The next morning, my doctor assured me that a good dose of antibiotics would work in the short run, with surgery only an option down the road if necessary. The bris was still on, and it was time for us to focus on the celebration. The day of the bris, my mother and mother-in-law came with Passover wines, cakes and cookies, along with fresh fruit. They covered the tables with white table cloths, and used an extra one to cover the crucifix that was hanging on the wall. Our family was all there, the rabbi was sweet and kind, and the doctor who performed the circumcision was steady handed. The adults, including the father and mother, handled the procedure calmly. The most attentive guest was our five-year-old niece Katie, who took a unusually close-up interest in the procedure. When asked if she wanted to be a doctor when she grew up, she replied. “Yes, or a fireman!” After the ceremony, we all sipped Passover wine and ate sponge cake and macaroons. Friends and relatives said good-bye, and Larry drove me and our soundly sleeping son home to Clifton Park. We now could begin our life as a family. I healed nicely, never needed surgery on the cyst, and, outside of having to call the paramedics my second day home after I got my wedding ring stuck on my finger, things settled down to the new normal of having an infant. Over the years, Adam has had to celebrate many birthdays with Passover sponge cakes and macaroons instead of the traditional birthday cake.. However, he and our family always enjoy the retelling of the Passover bris as much as the required retelling of our “sojourn from Egypt” at our seders. This entry was posted in Family Stories, Jewish Interests on April 20, 2014 by shapcomp18.